The early March preliminary Reuters/Michigan consumer sentiment survey results were bad enough, coming in at 70.5 and they got worse when they were finalized at 69.5 in late March. The full press release is available on the Reuters/Michigan website and also in my box of free trading goodies (in the Articles & Reports folder, named “Michigan Consumer Survey March 2008″). A recession you say? Well, I’ll be! There are several measures that Reuters/Michigan tracks. One of them is the “expectations index” which looks ahead to quantify how consumers see their future. In March 2008, this index hit (47.9) the lowest it has been since the 1973 recession (45.2). Yes, you read that right. Today… US consumers feel almost as hopeless about the future, as they did in the days of the oil shock, a brutal bear market, the rationing of gas (depending on your plate number), etc. Unbelievable! As you’ve probably surmised by now, each time that consumer sentiment has scraped the bottom of the graph, the stock market and the economy have stopped their decline. Starting with 1975, this was the end of the brutal bear market. Although equities didn’t bounce back, they stopped declining and entered a period of consolidation. The early 1980’s saw the break out from this consolidation and the launch of the great secular bull market. 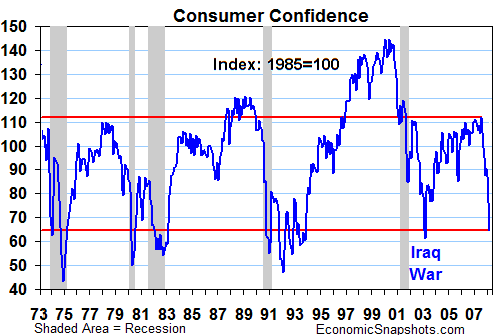 In 1990, the consumer sentiment spiked lower and the stock market followed with another significant long term bottom. Subsequent shocks in 1992 and 1993 don’t show a concomitant reaction from the market. The next time consumer confidence approached such levels was in early 2003, which was the bottom of the bear market that followed the bursting of the tech bubble. And now we are once again approaching these same levels. Which makes me wonder why consumers don’t have a long term memory? Collectively we seem to react with the IQ and recall ability of a one cell amoeba. Here are some more historical charts of consumer sentiment as measured by the Michigan University survey. I’m sure you’ve already seen it considering how on the ball you always are, but Ticker Sense had a similar post a few weeks back. Bisco, thanks. I wanted to show a lot more history so the pattern is clear.